If you are limited by the amount of space you have for a vegetable garden then consider growing your vegetable garden in containers. 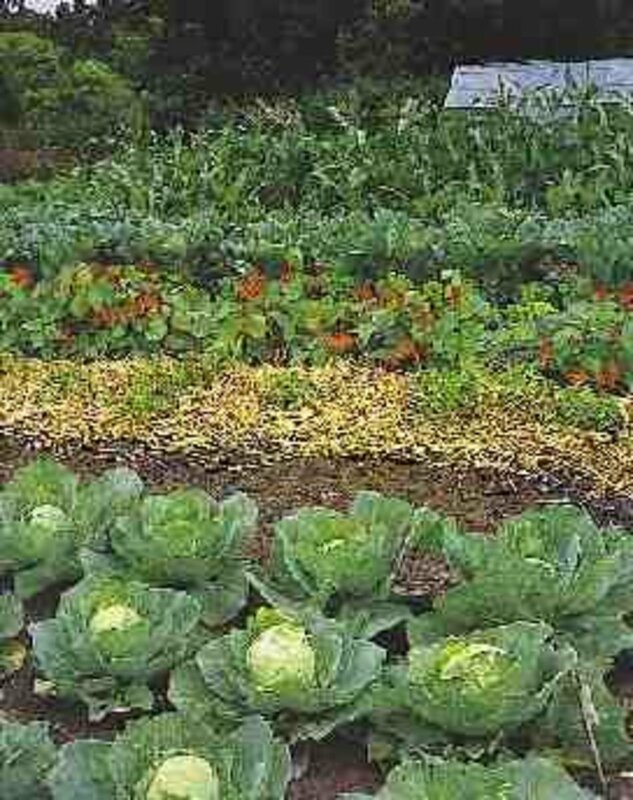 This way you can grow all kinds of delicious nutritious vegetables. You can easily do container gardening on a balcony, patio, porch or even on window sills. With container gardening you shouldn't have any problems with soil problems because you will be providing the soil for your containers and you can make sure that your soil is of the best quality possible. I always make sure that the soil I put in my containers is 70 percent topsoil and 30 percent well rotted manure or compost. Be sure to purchase manure or compost that is very well rotted and ready to use or your vegetable plants will get burned up. If you'll order a few seed catalogs in the spring you'll find that there are all kinds of vegetables that have been developed to be planted and used in container gardening. 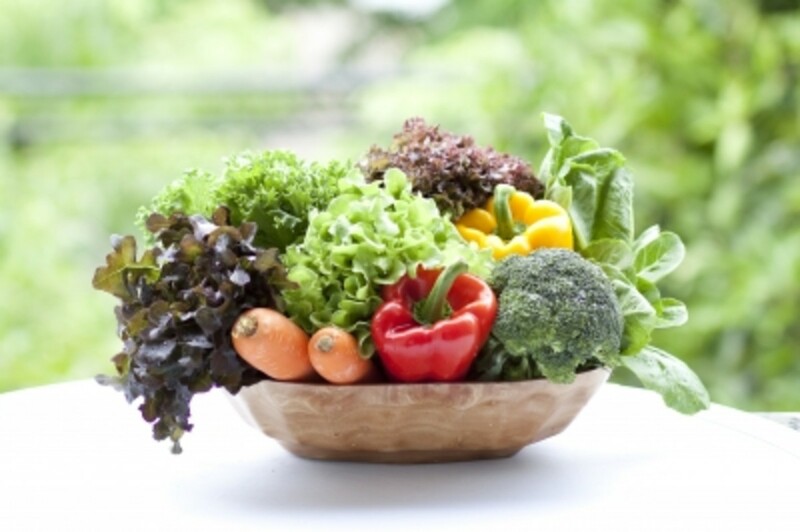 You should try to grow vegetables in containers that take up little space such as lettuce, radishes, carrots and etc. I grow pole beans in 4 foot by 4 foot wooden containers and they grow up and over a teepee of bamboo poles I insert down into the soil where I have the pole beans planted and I tie the teepee together at the top. The pole beans grow up and over the teepee and when the beans are grown they are easy to pick. Here you'll find a huge collection of the best recipes anywhere. If you want great recipes then you want to be sure to check out this great site. Send a few hits to this site and in about 12 - 24 hours your site will appear here in our link list. We hope to see your site appear here soon. If you have very limited space to grow a garden then consider growing vegetables in containers. 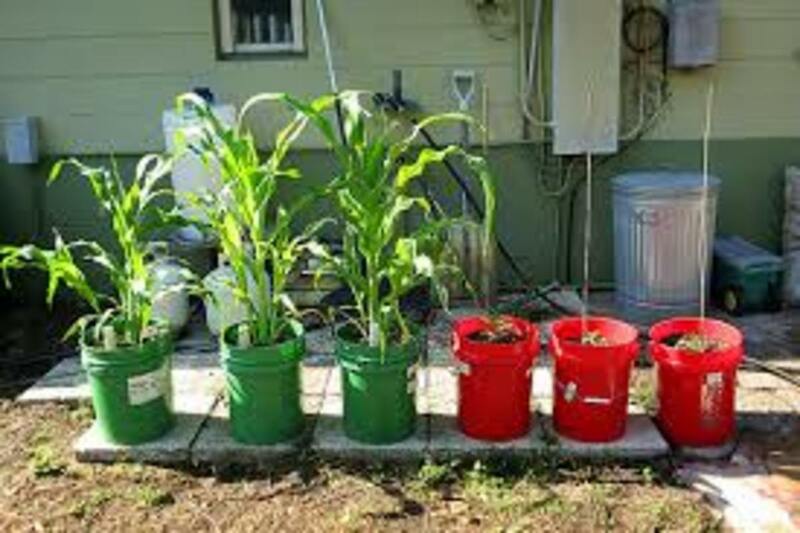 You may not realize it but you can grow and harvest great crops of vegetables in 3 - 5 gallon containers. Plum, Roma, and Cherry Tomatoes can be grown in hanging baskets. You can grow everything from Kale to Egg Plants in containers. You can grow great little herb gardens in small containers indoors on window sills. Trust me there is nothing that tastes like freshly harvested herbs. 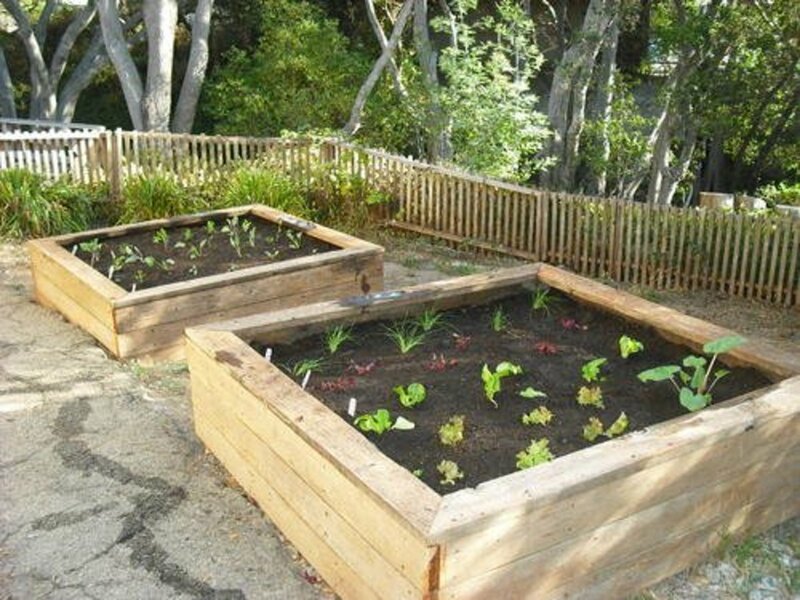 You Can Plant Vegetables In Raised Beds And Harvest Lots Of Fresh Delicious Vegetables. 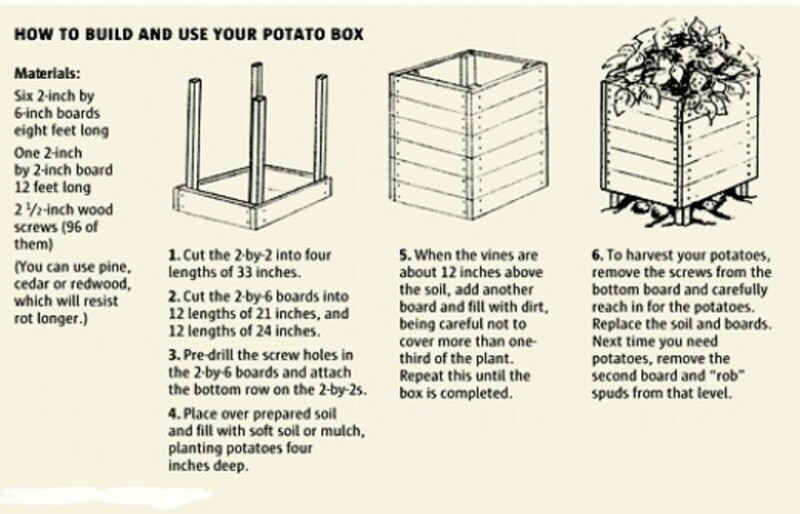 You can easily build a potato grow box out of wood and grow a huge delicious crop of potatoes in the potato grow box. Save the photo of the potato grow box to your computer and then print it off to make it easier to read. This potato grow box will fit in a 4ft. X 4ft. space and if you follow the instructions you will end up with a nice crop of potatoes that you grow yourself. There is nothing like homegrown potatoes cooked with fresh picked pole beans. Now that is some wonderful eating. 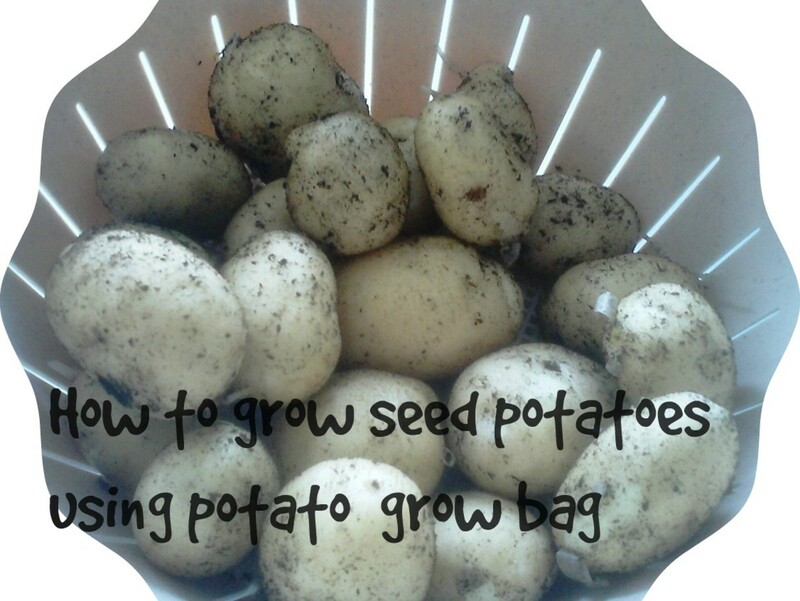 You should easily be able to harvest 100 pounds or more of potatoes from a potato grow box like this. I now have 4 potato grow boxes and I may add more in the future. 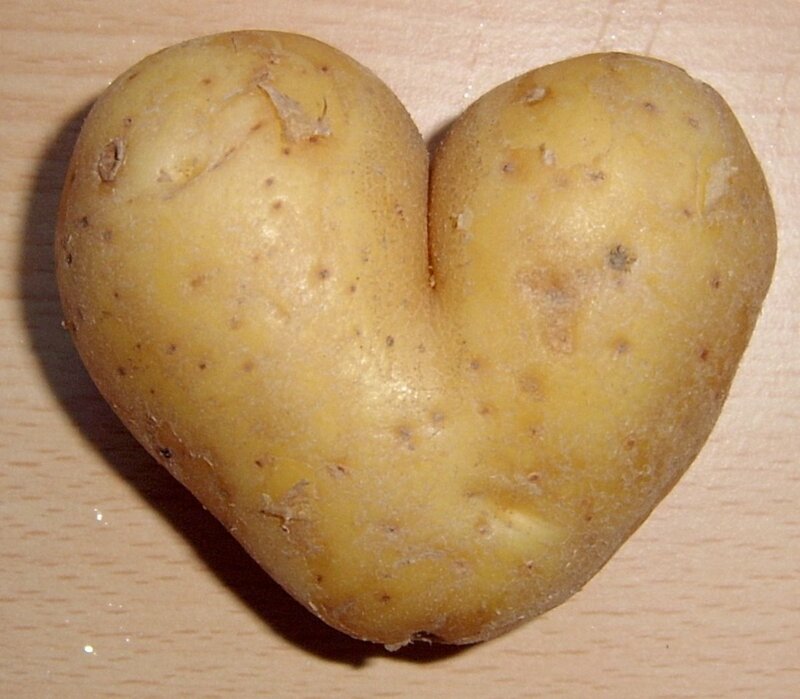 You can grow large crops of potatoes in tires using the same principal for growing your potatoes. Just add another tire on top and keep going up to harvest a huge crop of potatoes. Your vegetables grown in containers are just as susceptible to diseases and insects as those grown in a traditional garden. You want to get in the habit of checking your vegetable plants on a regular basis so you can see if the plant or plants are developing some type of disease or do you perhaps see some type of insect or caterpillar feeding on your vegetable plants. If you do detect disease or insects you will want to treat your plants in a timely fashion before they are completely destroyed. In most of the United States you can call and ask your county farm agent to come out and give you advice about what you should do. I caution everyone to read the labels carefully on any product you use to treat your plants for disease or insects. Plants that are tall spindly and don't produce. You need to move the container where their is full sun. Plants Turning Yellow From The Bottom Up. Reduce the amount of watering you are doing. Plants Wilt Even Though They Have Plenty Of Water. You Have Very Poor Drainage. Add More Drainage Holes To The Bottom And Sides Of Container. Add 3 - 4 Inches Gravel In Bottom Of All Containers. Use The Insecticide Suggested By Your Local Farm&Garden Center. Be Sure To Read The Labels Carefully. This Disease Is Caused By A Fungus. You Need A Product To Get Rid Of Fungus. Radishes are a great vegetable to grow in containers as they grow quickly and you will very soon be able to pull up radishes and eat them. Fresh grown radishes are so very delicious. If you will Click Here you'll find out all kinds of things about radishes even how to make a delicious radish pie. When you plant your radishes use a wooden spoon handle and push a hole about a half inch into the ground. Make holes for your radish seeds about 2 inches apart. When you go to plant the radishes put two radish seeds in each hole and then gently cover up the radish seeds in each hole. Keep the ground moist but not wet. Your radish seedlings should come up rather quickly. You will then want to keep the soil moist to the touch but not wet. You should have radishes in 28 - 35 days from the time you see those first radishes come up. Your radishes should be grown in soil that is 70 percent topsoil and 30 percent well rotted manure or well rotted compost. In my area I can buy a manure product with the name "Black Cow" and it is an excellent manure to mix into your top soil. This mixture of soil is an excellent soil mixture to grow radishes in. 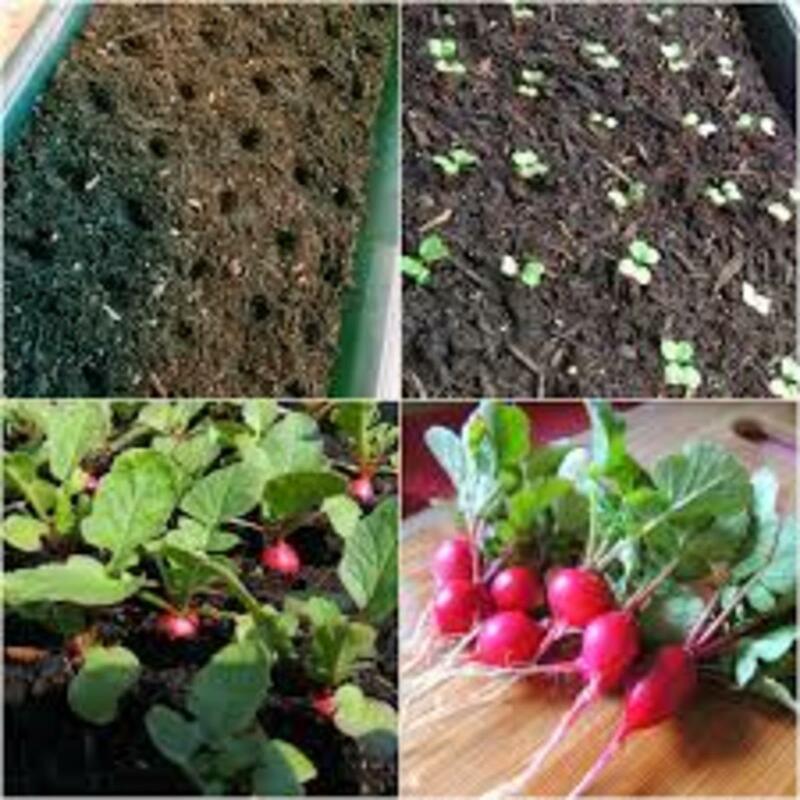 Your radishes will grow so fast that they will seem like they are jumping out of the ground. 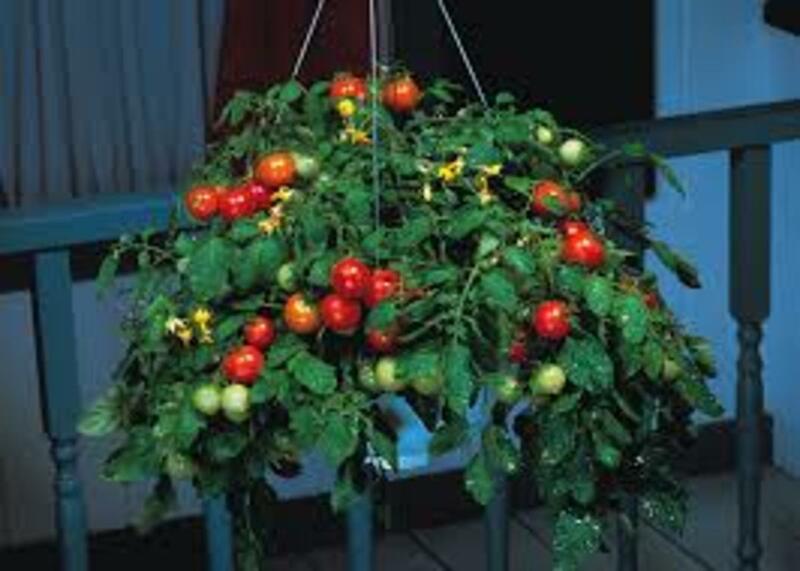 Salad, Roma, And Cherry Tomatoes Can Easily Be Grown In Hanging Baskets. You can easily grow tomato varieties like Roma, Cherry, and Salad tomatoes in hanging baskets. You want to be sure that your hanging baskets of tomatoes are very securely fastened so they will get blown down or fall down in a thunderstorm or when a strong wind is blowing. I usually purchase large hooks that screw into the ceiling and then I hang my hanging baskets of tomatoes from the hooks. I usually take duct tape and make sure that the basket of tomatoes is not going to get blown off the hook in a thunderstorm. I do this by making several rounds with the duct tape around the hook to keep my basket of tomatoes on the hook. The 70/30 soil mixture will work perfect for your tomatoes. This simply means that you have 70 percent top soil and 30 percent manure or very well rotted compost. You will want to mix this up together very well. I usually do the mixing up of the top soil with the manure in my wheelbarrow and then I fill up my containers that I am going to be using for my container gardening. I usually make my own dried tomatoes from the tomatoes I grow in containers and the flavor of those tomatoes is just wonderful. If you have a food dehydrator you can easily dry your own tomatoes and end up with wonderful dried tomatoes that you can use in so may ways. 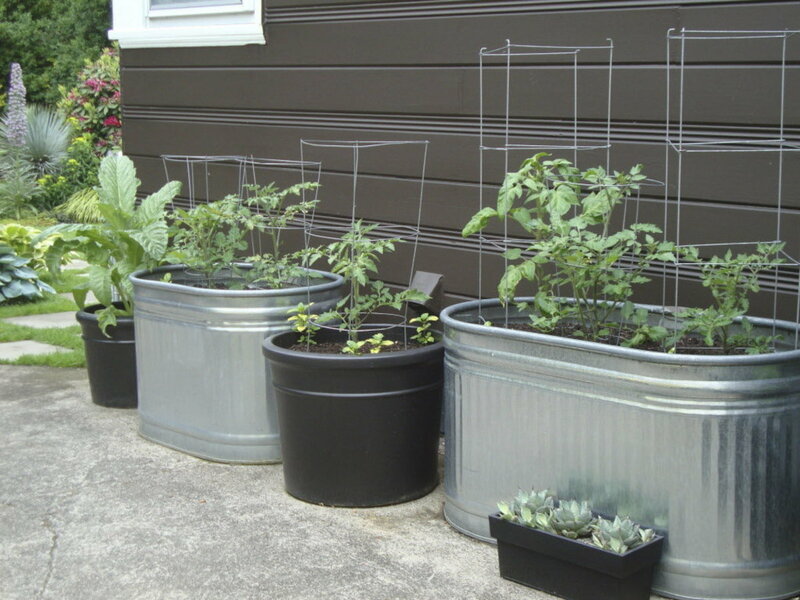 You Can Grow Almost Any Type Of Vegetables In Containers. 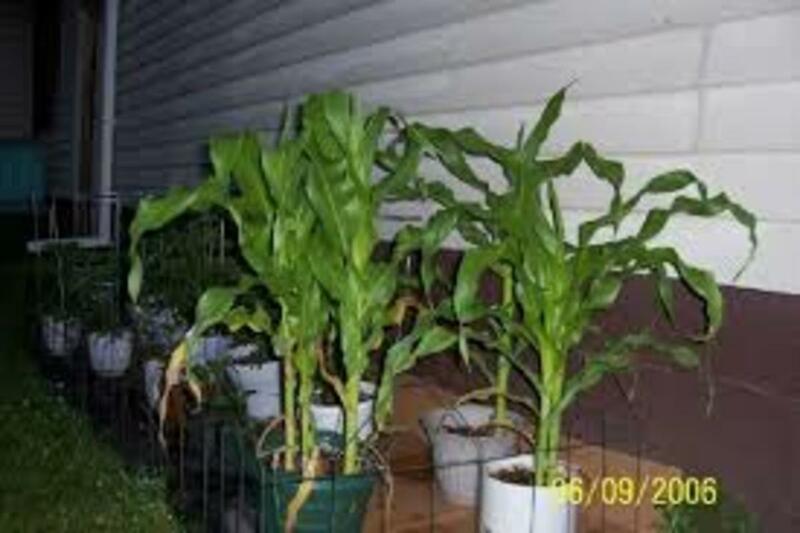 If your going to try to grow vegetables like corn in containers I suggest buying the smaller dwarf varieties of corn and you will want to be sure to plant your corn in containers that are big enough for the corn and so it doesn't get blown over in a heavy wind. You can easily drive a wooden stake into the ground at each container of growing corn and tie the corn to the wooden stake so it won't get blown over easily. I have planted the three sisters in large containers and this includes the corn, squash, and pole beans. You will need large containers if your going to try this. You let the corn grow until it is about a foot tall and then you plant pole beans at the base of the corn. Plant two or three seeds of pole beans and after it comes up and starts to grow wind the pole beans up and onto the corn. You want your pole beans to grow up the corn. Come back a foot or so away from the pole beans and plant a hill of squash. The early Native Americans called corn, beans, and squash the three sisters and this is how they were growing vegetables for hundreds of years. 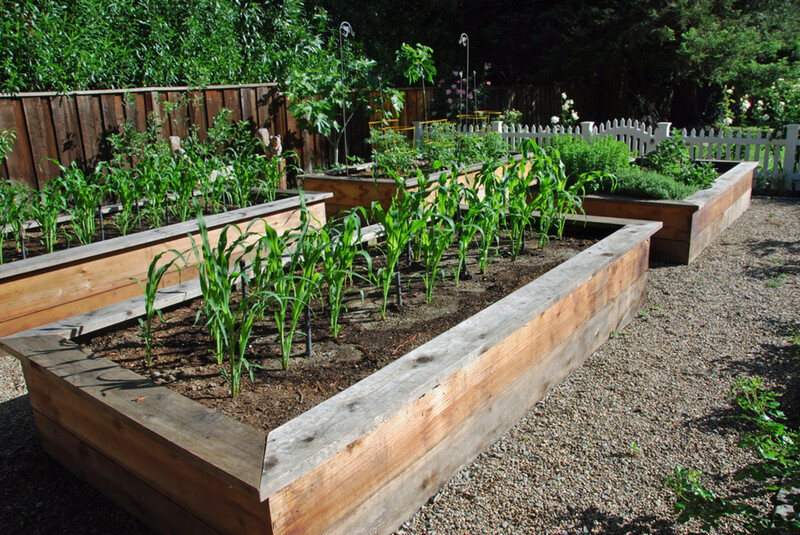 You are able to harvest corn, beans and squash this way and use a lot smaller growing space to grow your vegetables in. More Container Gardening Tips, Hints, And Tricks. Your container garden area will need at least eight hours a day of full sun if your vegetables are going to grow and produce well. Keep in mind that most vegetable plants need full sun and they will not do well in the shade. So be sure to look for a place to set up your container vegetable garden where the vegetables are going to be in the full sun for most of the day. You can brighten up a dull patio area by adding a few barrels of tomatoes and maybe a container or two of mixed herbs. I've been planting various herbs in the same container and that way I am able to harvest various herbs from a small space. And there is nothing better to cook with than fresh herbs. You can pick your own fresh herbs and use those fresh herbs to make herb flavored oils and vinegars. You will want containers that are large enough to support your vegetables when they are grown. Every container you use for container gardening must have enough holes for adequate drainage. And you want to be sure that any containers you use have never held anything that is toxic to humans or animals. And most containers used for growing vegetables should be 6 - 8 inches deep for proper root development. Using a standard soil mixture of 70 percent top soil to 30 percent well rotted manure or compost will work perfect for your container gardening. Be sure to mix your top soil and manure or compost together in a large container or a wheelbarrow before you add it to your containers where you are going to be planting your vegetables. You will want to be sure that any container you use has plenty of holes for drainage. If it's a large container add 4 - 6 inches of small rocks and gravel to the bottom of the container before you add the top soil. For the best results you will want to be sure that any container you plant your vegetables in has 6 - 8 inches deep of soil so that your vegetables can develop adequate roots. Your vegetable plants like corn, cayenne peppers and tomatoes will need extra support like a large wooden stake driven into the ground beside them to prevent them from getting blown over in a strong wind or thunderstorm. You can use metal tomato cages with your tomatoes but you may still need to drive a large wooden stake in the ground beside the container and fasten the tomato cage to the wooden stake to make sure the tomato plant and tomato cage don't get blown over. I always plant a few marigolds around my container vegetable garden and by doing so I am bothered by far fewer garden pests. If you will plant marigolds close to your tomatoes you will almost never be bothered by tomato pests. Tomato horn-worms will almost never come around marigolds. If you will check with your local restaurants and cafes you may find that they will give you all the 3 - 5 gallon buckets you will ever need. Just be sure to wash and clean them well before you drill drainage holes down the sides and in the bottoms of your buckets. I find that if I put 3-4 inches of gravel in the bottom of 5 gallon buckets that I never have drainage problems. Please Feel Free To Post Your Comments About Container Vegetable Gardening. Thanks For Reading. Lots of great ideas here, thank you. I am inspired to get going with something in my garden now! Thanks for kind words and comment. It is appreciated. This is one useful, info packed hub and just what I will be needing to get me started on container gardening this spring. As always, fabulouys work, crazyhorsesghost. Voting this up and useful. We have a big yard for growing vegetables so I don't need to use containers, but it's such a good idea for people who don't. Or even for people who have the space but can't get around that much to take care of a garden. A container garden would be ideal. I love that picture of the cherry tomatoes growing in a hanging basket. I gave this hub a thumbs up and useful. I usually replace plastic containers every 3 years and wooden containers every 3 - 5 years. Thanks for your comment. I like the basic ideas with the containers, but the containers that I know have lasted more than 10 years out in the sun and the elements has been the MiKris grow cells. I don't really think any of the containers you have up here could claim this???? Have any of these containers lasted that long out in your yard. Over ten years of gardening with our methods I feel very confident in what I say. See the website www.mikriscoop.com. Thank you!!! Seriously I don't mean to be confrontational.